On paper, the all-new Ford Ranger certainly seems like a great bakkie. But how does it perform on gravel and in an off-road environment? Does it have what it takes to play in the rough? 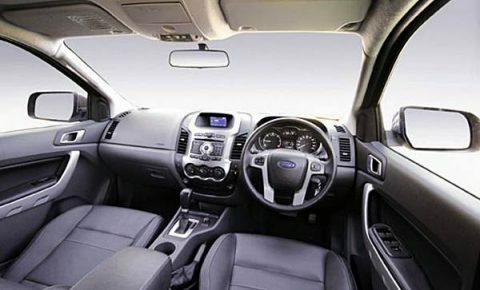 In case you did not know, here’s an interesting bit of information: the new Ford Ranger was designed in Australia. By Australians. Now, while this might annoy the patriotic rugby and cricket fans among us, it is perhaps best to put our Wallaby prejudices aside in this instance. The fact that Ford’s new bakkie hails from Down Under is actually a very good thing. How so? Well, while we might not want to admit it, there are a lot of similarities between South Africans and Aussies, especially when it comes to overlanding and adventure motoring. Like us, the Australians are passionate about off-road driving. You need only look at the number of Australian aftermarket 4×4 accessories in our stores (TJM and ARB, for example) to realise this. So one could reasonably assume that a bakkie built to deal with Outback conditions should perform well in places such as the Kgalagardi, Kaokoland and Richtersveld. Surely this is a bakkie designed to provide South African double cab drivers with exactly what they want? When it comes to the power-plant, Ford has definitely given bakkie fans what they want. The company has not opted to use a lower-capacity engine – such as that in the Amarok – instead deciding to drop a burly 3,2-litre oilburner into the Ranger’s engine bay. Is a big engine like this really better than a smaller two-litre version such as the Amarok’s? It’s tough to say. Many vehicle manufacturers seem to feel that smaller engines with more power (and multiple turbos) are the way of the future. Bakkie owners in general, however, seem unsure, with many preferring larger engines. 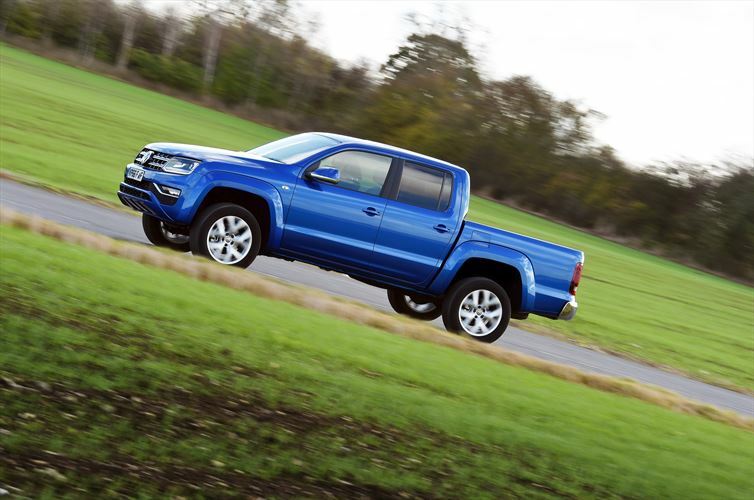 While most of bakkie drivers we’ve come across say they love the comfort and performance of the Amarok, some have also expressed doubts about the two-litre engine. Ford’s engine philosophy should be to their liking. However, even Ford seems to be realising that the powerful engines of old will become increasingly difficult to market in future. In the US, the company sells the ubiquitous F150 with a choice of either a five-litre V8 or a 3,6-litre Ecoboost V6 engine. And since the middle of last year, the V6 models have been outselling the V8s, so even the Americans are realising that the rise of the smaller-capacity engine is inevitable. Regardless, the Ranger’s engine has exactly the capacity South Africans are accustomed to. Moreover, it offers more power (147 kW) than just about any of its competitors. Only the powerful but pricey Navara 3.0 dCi, with its 170 kW and 550 Nm of torque, bests it. The power is evident from the moment you set off. The 3198cc, five-cylinder engine feels strong and accelerates nicely. The Ranger is still a vehicle that weighs more than 2000kg, so it won’t astonish you with its speed, but for a bakkie, it does really well. The power is also very usable. A reasonably flat torque curve ensures that it doesn’t run out of steam too quickly. Peak torque (470 Nm) is available from 1500 r/min to 2750 r/min. After 2750 r/min, it starts to dip a little, but at 3000 r/min you’re still left with around 460 Nm. At 3250 r/min, you have 400 Nm. The oilburner also benefits from an excellent six-speed auto shifter that complements it well. There aren’t many double cabs with six-speed boxes, so the Ranger distinguishes itself with this extra cog. The gearbox certainly feels competent, offering predictable changes. That said, we probably would not opt for the automatic model if we planned on doing loads of low-range work (we still prefer a manual transmission for this). But for most buyers who will be using the vehicle mainly over long distances and to negotiate traffic, the auto shifter makes sense, providing a relaxed drive. It should also be mentioned that the Ranger boasts features that are fairly new to the segment. It has “roll-over mitigation”, adaptive load control, trailer-sway control and traction control – all aimed at stabilising the vehicle when towing, carrying a heavy load or dealing with tricky surfaces. The cabin of the Ranger is a nice place to be. And unlike the previous model, even its rear seating is comfortable and spacious. Getting into the back seat is easy, thanks to the fact that the double cab models have smaller front doors than the single and extended cabs, allowing for larger doors at the rear. The front is airy and spacious, and has all the modern accoutrements. It has a good sound system with Bluetooth capability, as well as USB and iPod connectivity. It also has cruise control, auto headlamps and leather seats. Yes, the Ranger’s cabin has everything you could ask for, but it still feels like that of a workhorse. It is modern, but practical. Noise, vibration and harshness (NVH) levels are fairly good. Sitting in the cabin, you can hear the rumble of the oilburner and the road noise emanating from the chunky tyres, but for a bakkie, the Ranger performs excellently. The Ranger has one of the most comfortable cabins in its class, though we think that the Amarok beats it by a small margin. As with any bakkie, the Ranger feels a bit skittish when traversing an ugly gravel road unladen. During an overland trip, however, when its load area is full, it should handle well. The Ranger has some clever gizmos designed to improve stability on gravel. According to Ford, when four-wheel drive is engaged, the vehicle’s electronic stability program (ESP) makes subtle changes to the engine and brakes to provide a safer drive on dirt. Although it is tough to say exactly how effective these systems are, there is no doubt that the vehicle felt more stable once 4WD was engaged. 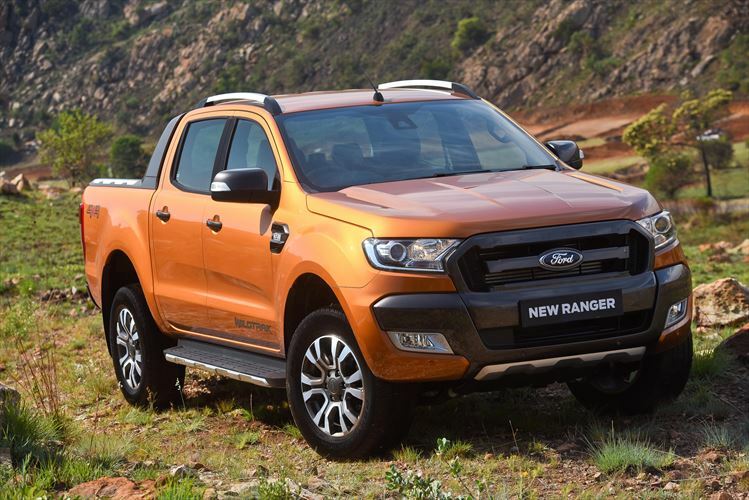 As mentioned earlier, it also boasts roll-over mitigation and traction control, so should things go horribly wrong, the Ranger’s electronics will help bring the bakkie back under control. This obviously helps a lot when it comes to the feeling of confidence the vehicle offers the driver. Comfort on gravel roads was good, but the Ranger still felt, well, like a bakkie. When it comes to sheer ability to smooth out bumpy roads and soak up imperfections, we think that the Amarok has the rest beaten. Although the Ranger’s cabin remained comfortable, it wasn’t as SUV-like as that of the Amarok. That should not suggest that the Ranger performed badly. It did very well, but always felt like a workhorse. You have to consider, though, that the Ranger has a very impressive payload capacity (1049kg), so the slight bumpiness to its ride when empty is perhaps the inevitable result of a suspension that’s designed to deal with bulky loads. 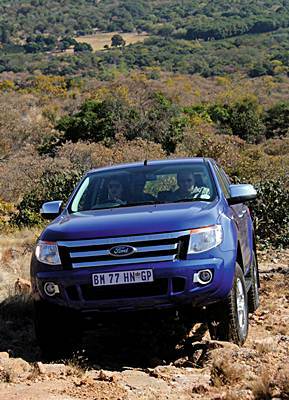 In standard guise, the Ranger is a competent 4×4 that’s clearly been designed with off-road driving in mind. For example, when low-range gearing is engaged, the throttle response is changed, making the accelerator pedal less responsive. This means that you won’t accidentally accelerate when driving over very bumpy terrain. The engine, radiator and fuel tank all have shields to protect them. The fuel tank has also been fitted quite high, preventing it from bottoming out. Driveline components are mounted above the frame rail so that things such as the transfer case and oil pan are protected by robust cross-members. The ESP is also adjusted in low range 4×4. Moreover, the program can be partially switched off, meaning that it won’t intervene when it senses over- or under-steer, or reduce torque when it detects a loss of traction. As mentioned, the ESP comes with a traction control system, but this thankfully doesn’t mean that the bakkie lacks a diff lock. While the traction control system did help during our test, we still found it best to use the diff lock when dealing with cross-axle situations and loose stones. The Ranger is equipped with hill launch assist and hill descent control. Hill launch assist holds the brake for two seconds when you set off on a slope, while hill descent control applies the brakes when dealing with a steep descent. 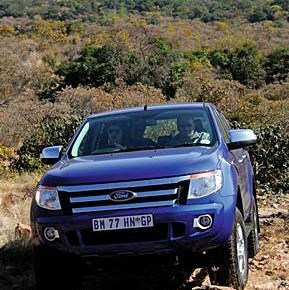 Overall, the Ranger performed well on a 4×4 trail – about as well, in fact, as one can expect from a standard bakkie. As with most double cabs, it is hampered by its long wheelbase and wide stance. The Ranger is a seriously big vehicle, which makes navigating tight tracks quite difficult. It also results in approach, departure and break-over angles that aren’t fantastic. Ground clearance isn’t bad. It is quoted as 237mm, but we found clearance at the rear diff to be around 220mm, which is similar to that of most bakkies. The automatic gearbox works reasonably well in an off-road environment. The hill-descent control helps and it crawls fairly slowly in first gear low range, but it still can’t quite compete with the engine braking offered by a manual transmission. If you are looking purely for a trail vehicle, you should not buy a Ranger. Nor should you buy any other double cab. Modern bakkies are just too long and wide to deal effectively with obstacles. But the Ranger offers a good balance between practicality and off-road ability. It can’t compete with a vehicle such as the Wrangler Rubicon, but it is far more versatile. Its large size might hamper it on 4×4 trails, but it makes the Ranger an excellent overland vehicle, since it has loads of space for supplies and camping equipment. The Ranger has also been on the market long enough now to ensure that aftermarket accessories are available. Companies such as Alu-Cab offer excellent canopies and drawer systems for the bakkie. And if you plan on travelling overland, these are necessities. A bakkie has lots of space, but without these accessories, your clothes, food and equipment are difficult to store and access. The powerful 3,2-litre engine, combined with the six-speed automatic ’box, makes it a joy to drive over long distances. 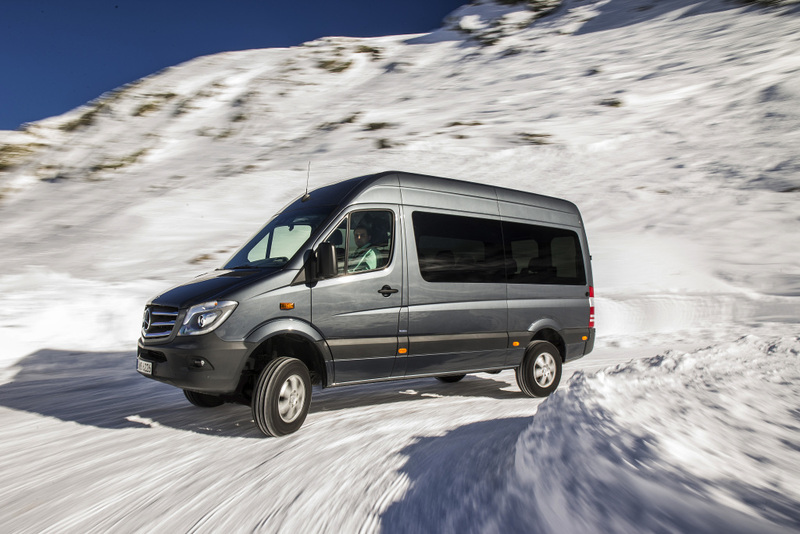 The spacious cabin ensures that four adults can travel hundreds of kilometres in comfort. Should you find a deep pool standing between you and one of Moremi’s campsites, you can take solace from the fact that the Ranger has an 800mm wading depth. While 50ppm diesel is always the better fuel option, Ford’s bakkie can deal with 500ppm when it needs to, so there’s no need to worry too much if you don’t have access to low-sulphur diesel. Fuel consumption is okay. We averaged 11,39 litres per 100km, but this involved a fair bit of low-range driving. When travelling on open roads, one should be able to wring more kilometres out of every litre. The vehicle comes standard with Continental Cross Contact all-terrain tyres, which is a nice touch. You feel as if the bakkie was truly made for trail driving and gravel travel. The new Ford Ranger is an excellent off-road vehicle. Not only does it offer lots of power but it has plenty of electronics to make driving off the beaten path a safer and easier proposition. Of course, one could argue that the Ranger is too advanced. After all, those electronic gadgets are nice to have, but what happens when they break down in Africa? The fact of the matter is: the days of the simple, naturally-aspirated “plaas-bakkie” are over. Thanks to the stringent safety and environmental regulations imposed by governments all over the world, simple vehicles that can run on dirty diesel and have no electronics are a thing of the past. Like the Amarok, the Ranger is part of a new generation of bakkies that deliver the features one would expect in an SUV. 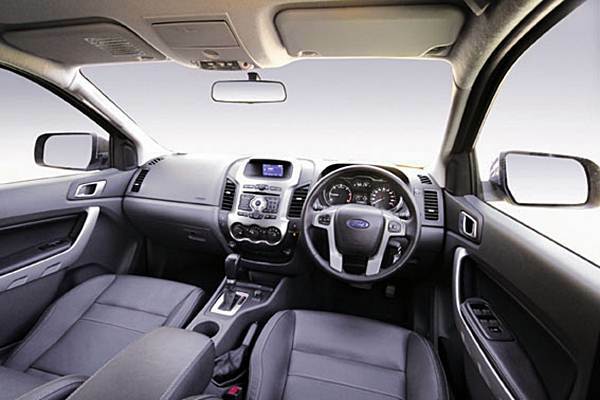 And Ford’s double cab does an excellent job of providing good comfort and performance while still retaining that feeling of robustness that we want in a workhorse. WE LOVE: The engine power. BUT WE DON’T LIKE: Its bulk on twisty trails. 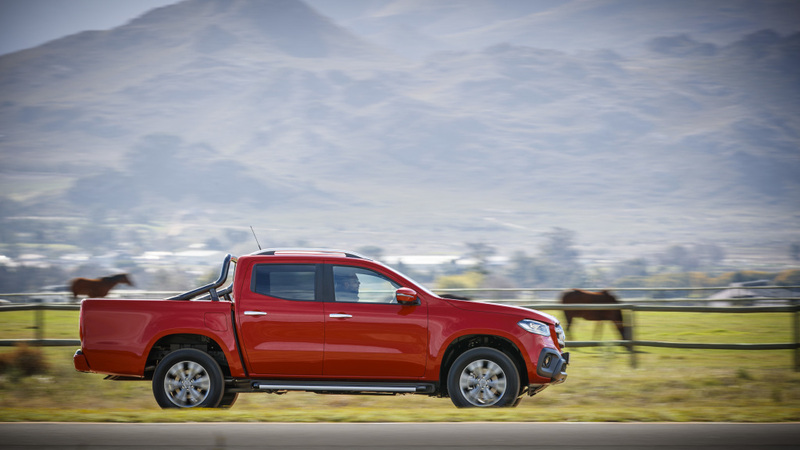 WE SAY: An excellent bakkie that is both a solid workhorse and a great leisure vehicle.